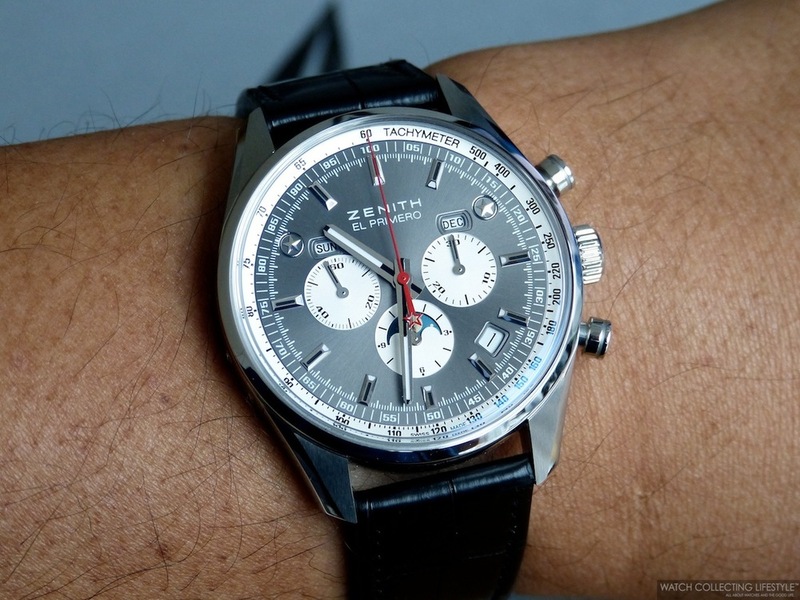 Insider: Zenith El Primero 410 Limited Edition. Only 500 Pieces of One of the Most Beautiful Chronographs with Annual Calendar. 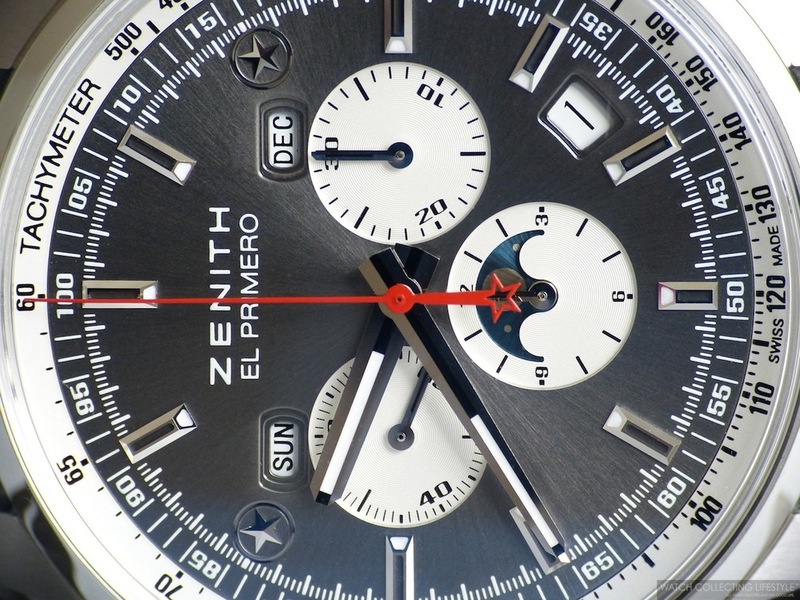 The Zenith El Primero 410 Limited Edition ref. 03.2092.410/91.C496 of which only 500 pieces are available is without a doubt one of the most beautiful chronographs equipped with an annual calendar out there. 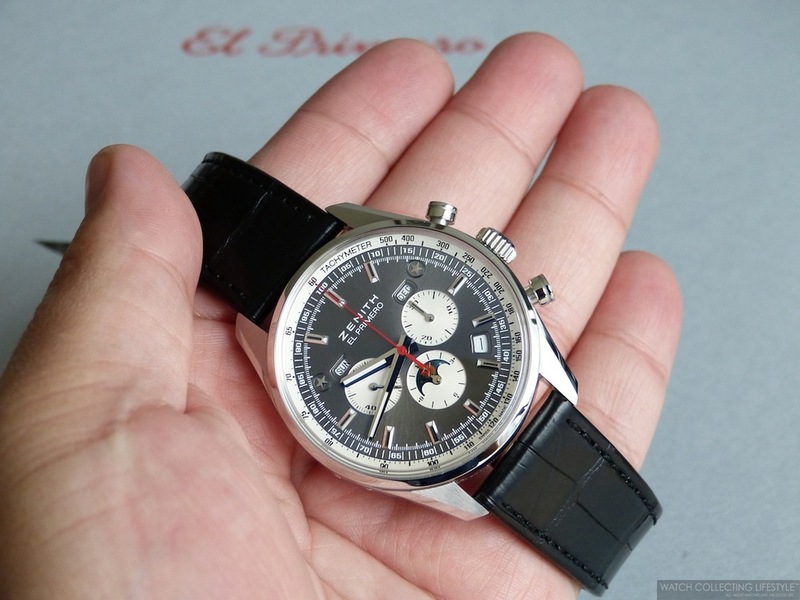 But what makes this El Primero 410 better and greater than other chronographs, it's the fact that you not only have a vintage inspired timepiece with a fully integrated automatic 12-hour chronograph, but you also have the amazing complication of an annual calendar with moon-phases at a very reasonable price. The Zenith El Primero 410 is fitted with a 42 mm highly-polished stainless steel case with satin-brushed lugs and with a thickness of 12.75 mm —not bad for such a robust calibre. This watch features the traditional El Primero pump pushers and a beautiful and solid crown with the Zenith star on relief. The case band features two correctors at 8 o'clock to adjust the moon-phase indicator and the day of the week and the overall look of the watch is sporty, yet very elegant. This modern interpretation of the El Primero from 1969 features a slate grey sunray dial that is beautiful but somewhat busy. The dial features silver-toned recessed chronograph registers, faceted rhodium-plated applied markers with superluminova, faceted hands also with superluminova, a running seconds register at 9, a 30-minute chrono-register at 3, a 12-hour chrono-register with integrated moon-phases indicator at 6, a date aperture between 4 and 5, a day of the week aperture at 10 and a month aperture at 2 o'clock. The 10 and 2 o'clock faceted markers have been replaced by two beautiful stars on relief, the silver-toned flange features a tachymeter scale and its red chrono hand provides the perfect amount of contrast to the dial. Perhaps the biggest downside to the design of the dial is that the moon-phase indicator can hardly be appreciated unless the hand on the 12-hour chrono-register is somewhere between the 3 and the 9. The domed sapphire crystal with anti-reflective treatment on both sides provides perfect readability and visibility to the dial, which depending on the lighting conditions and the angle that you look at it, will make the dial vary in color all the way from a deep charcoal grey to a light silvery grey. In the dark, the superluminova on the hands and markers glows nice and strong. The beating heart inside this watch is the complex and delicately finished automatic Zenith calibre 410. The number of the calibre gives this watch its name. This advanced and very accurate calibre is composed of 390 parts and 31 jewels and provides a power reserve of 50 hours while beating at a frequency of 36,000 vph —5 Hz. 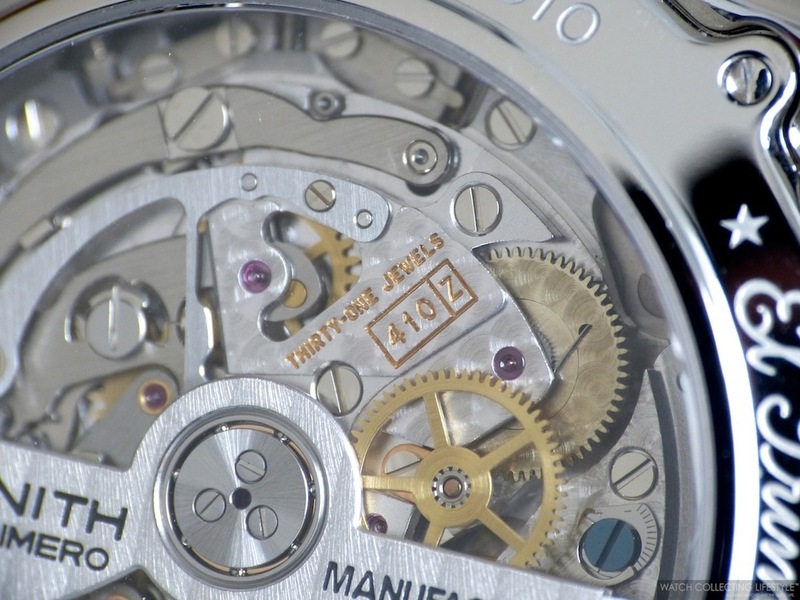 The calibre is fully visible via the display case back. One interesting thing about this calibre for those of you not familiar with it, is that the time is set by pulling the crown out to the first position, while the date is set by pulling it out to the second position. This calibre is a true workhorse properly designed to maintain excellent timekeeping for a lifetime. The idea behind the original El Primero from 1969 was simple, but the technical specifications were not. It was to be the first automatic chronograph ever. Better still, the caliber was to be fully integrated and designed as an inseparable whole. There would be no additional module, but instead a construction built around a column wheel and a central rotor mounted on ball bearings. It would also need to beat at a high frequency in order to be the world’s most accurate chronograph. 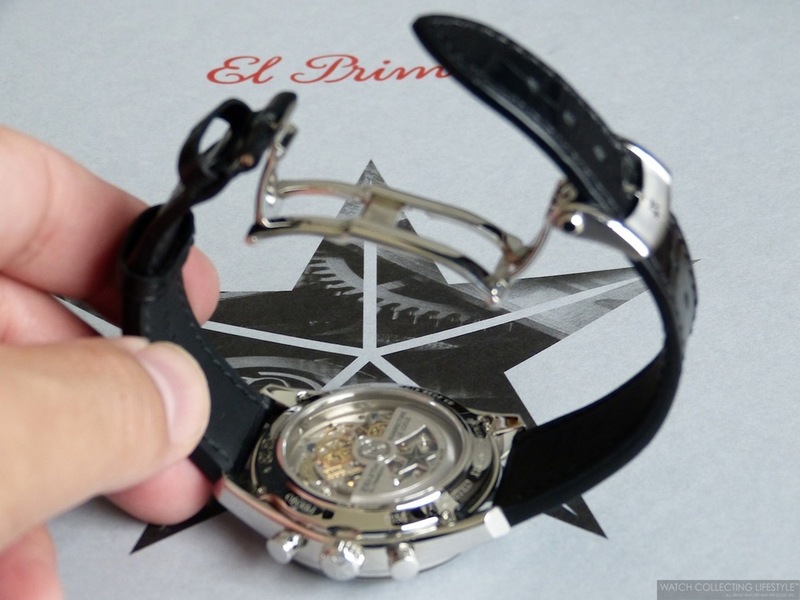 To complicate matters still further, the movement was to be miniaturized and equipped with a date mechanism. All these factors amounted to an equation so complex that it would take seven years to solve it —four years past its scheduled launch date. This sporty yet elegant chronograph is fitted with a matte black alligator strap with protective rubber lining and a very comfortable triple folding clasp designed to look like a pin buckle. The clasp features the Zenith star on relief with brushed and polished accents. On the wrist, the Zenith El Primero 410 Limited Edition wears extremely comfortably but slightly smaller than its actual size and more like a 40 mm watch. The wrist presence is unparalleled and opposed to the sporty look of most chronographs, the El Primero 410 Limited Edition offers the perfect balance between elegance and sportiness in a watch that goes great with a suit or with jeans. Not bad at all for the price. Sticker Price $10,600 USD. For more info on Zenith click here. Posted on December 4, 2017 by Editor & Publisher and filed under Zenith and tagged Zenith ref. 03.2092.410/91.C496 Zenith El Primero 410 Limited Edition 500-Pieces Zenith Mainstream Brands 2017 Chronographs Annual Calendars Most Popular.